The Nikos Apartments Stalis are located in a quiet and secluded area of Stalis in Crete, just 150 metres from the Blue Sea beach. The bars, restaurants and nightlife of the beach road are only 300 metres from the Nikos Apartments. Stalis is located on the northern coast of the island close to the bustling resort of Malia and is an ideal spot for a relaxing holiday with the option of dipping your toes in the lively nightlife at Malia. 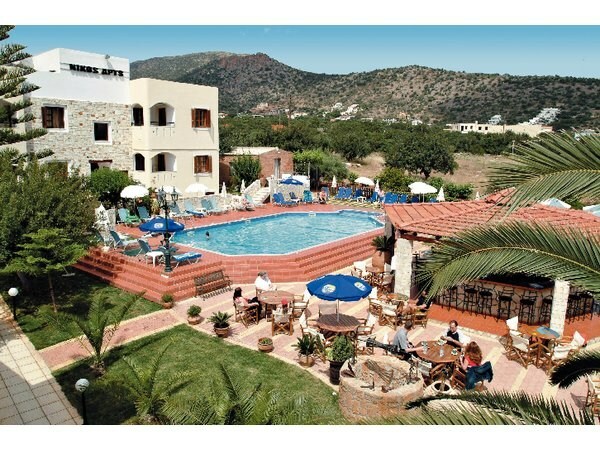 So book today!The 4-star Crete apartment complex is 20 miles from Heraklion airport, so transfer times are around 40 minutes to your destination in Stalis. Nikos Apartments consist of flexible accommodation; each apartment has air conditioning, telephone, kitchenette with 2 cooking rings and a balcony/terrace. Onsite there is a swimming pool with sun terrace and loungers, currency exchange, childrens playground and a poolside snack bar serving refreshments and snacks throughout the day on your holidays to Stalis.